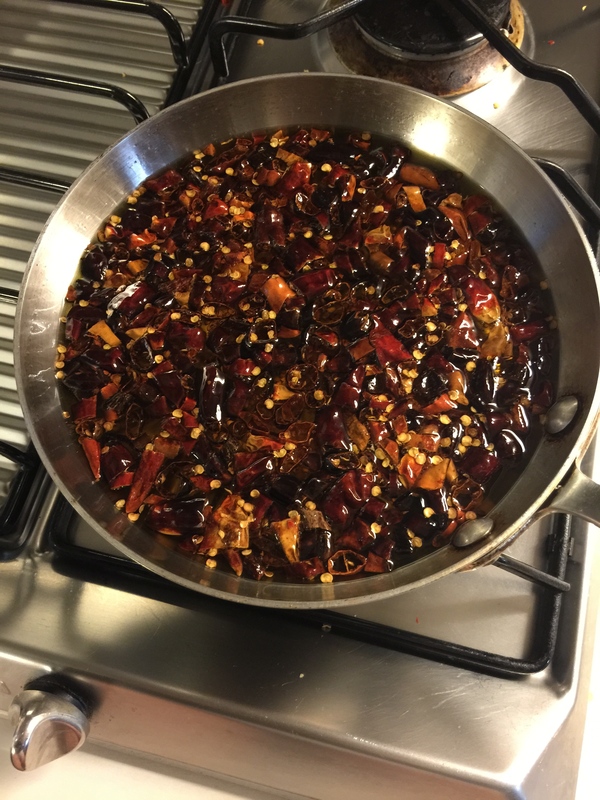 I felt a bit silly when I realized how easy chili oil is to make. Living in China, I used to throw a bottle in my cart at the supermarket to put on my homemade dumplings (and well just about everything else too!). But one day I had an over abundance of dried chilis left over and thought I’d give it a whirl. It took 5 minutes… no joke! And cost about 30 cents USD. I am never buying chili oil again, and neither should you! Heat neutral oil – such as vegetable, canola or grapeseed- in a small pan until it starts to bubble. (The amount of oil depends on the amount you want to make, I usually use about 1 cup). Add chopped dried chilis, seeds and all. Let come to a sizzle and keep there about one minute. Turn heat off and let cool to room temperature. Store in an airtight jar. Keeps for about 6 months and gets better every day! See how easy that was??? Besides dumplings, which may not be a common thing where you live, I love to drizzle this on grilled chicken or steak, on pastas and even on some veggies to give them a bit of a kick.